Use this covering letter example if you are going to apply for a Pensions Administrator job. 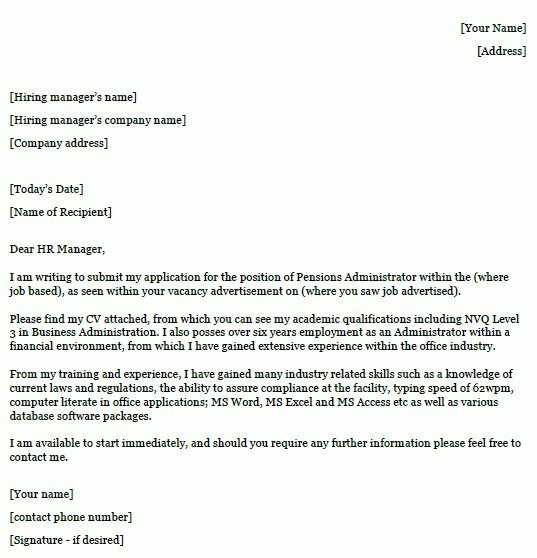 I am writing to submit my application for the position of Pensions Administrator within the (where job based), as seen within your vacancy advertisement on (where you saw job advertised). Please find my CV attached, from which you can see my academic qualifications including NVQ Level 3 in Business Administration. I also posses over six years employment as an Administrator within a financial environment, from which I have gained extensive experience within the office industry. From my training and experience, I have gained many industry related skills such as a knowledge of current laws and regulations, the ability to assure compliance at the facility, typing speed of 62wpm, computer literate in office applications; MS Word, MS Excel and MS Access etc as well as various database software packages.